A red-haired expatriate hippie with a beard and a business suit sat on the floor across from me in a Japanese restaurant in the middle of Sao Paulo, Brazil. Think Jerry Garcia meets Howdy Doody. Lincoln, a former Peace Corps volunteer, was regaling myself and a friend with stories of his escapades in Latin America. I vaguely remember him talking about starting a business importing condoms. He was concerned about the quality of those available in country. It was unclear if his interest was driven by humanitarian or by personal reasons. 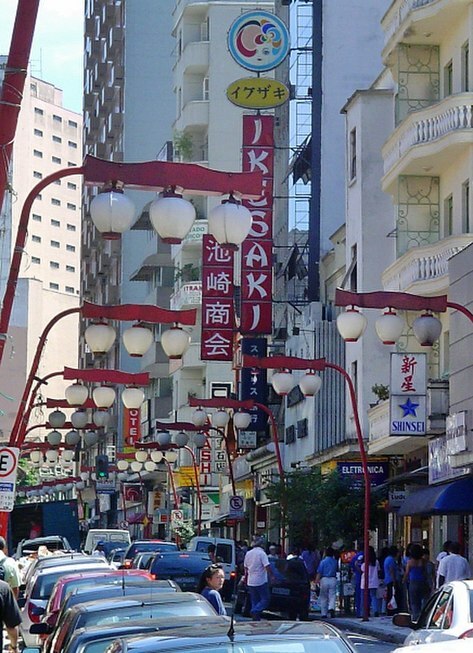 The Liberdade neighborhood, Sao Paulo, Brazil, is home to the largest Japanese population outside of Japan. One of his asides that day has stayed with me. He remarked, ‘the only time expatriate children are happy is in the air, either going to or from home.’ I’ve referred to this story many times over the years…and recently when discussing my transition. What is it about the airplane that settles these kids who are constantly transitioning? This week’s book, Smart Women Embrace Transitions: How to Lean into Change with your Body, Mind and Soul, by Sheri Keys McConnell, was a disappointment. My conclusion underscores that I’ve now plumbed the depths of transition literature…having found a few gems and many duds. The book is a compilation of 19 transition short stories authored by life coaches. Each weaves a tale but in reality they’re thinly veiled marketing pieces for the author’s respective self-help business. Keys McConnell’s only contribution to the book is housed on 8 pages and features ‘5 steps to positive transitioning.’ These include Novofemina favorites like gratitude (Leading with gratitude, December 2011), and topics like ‘forgiving yourself.’ Overall she posits that women who wish to grow, otherwise known to her as smart women, constantly transition throughout their lives. Constantly? I couldn’t agree more. Two of the nineteen stories caught my attention. In Letting Go: Giving Life to a Dying Spirit (Smart Women, pg 95) Joy Perrarras, who transitioned through a painful divorce, introduced the concept of ‘sharing more of yourself’ as an outcome of her transition. If I’m honest I’ve unknowingly begun to share more of myself during this process as well. Was it sheer exhaustion that dictated my distance before? Or something else entirely? In Victory Begins Within by Ginny Victory I found an extension of the psych reading that I’ve done lately (Summer Book Review #25: Meeting at the Crossroads; and Summer Book Review #23: Odd Girl Out). “In school girls are praised for catching on quickly, for proper behavior, for having the right answers, for being self-effacing. Because this behavior is so natural for girls, we think it’s our identity or the source of what makes us good or valuable. When we encounter change or challenges those old impressions spring up and cause us to feel pressure to do it ourselves, over-analyze and second guess, not speak or finesse the truth, hide, or worse, give up.” (Smart Women, pg 143) Is there any truth to this stuff? Can it be behind the actions of some of the outstanding women whom I’ve met who’ve stepped back entirely? I keep thinking about Lincoln’s expatriate kid’s story….There is a peacefulness to being in transit. Having departed but not yet arrived. For women’s transition the ‘destination unknown’ component introduces a host of complexity not present for the traveling kids. I met Lincoln while pursuing an earlier dream…to work internationally. With the benefit of hindsight this expatriate stint started a transition that launched me in a direction that I never before envisioned. So, more than a year into my transition, I remain in transit but ever more hopeful of its positive destination. This entry was posted in "Transition" Book Reviews and tagged career transition, Liberdade Sao Paolo Brazil, linda rossetti, novofemina, Peace Corps, Sheri Keys McConnell, Smart Women Embrace Transitions, women's issues, women's transition, women's transition issues. Bookmark the permalink.